Celtic Cornerstone Plaque - - personalized with a two-line address. Wall mount. 12.5"W x 7"H. Made in USA. Also referred to as our Irish house number plate. Irish theme address sign features an elegant Celtic knot border, a symbol that represents the interconnection of all things and the continuous cycle of life. 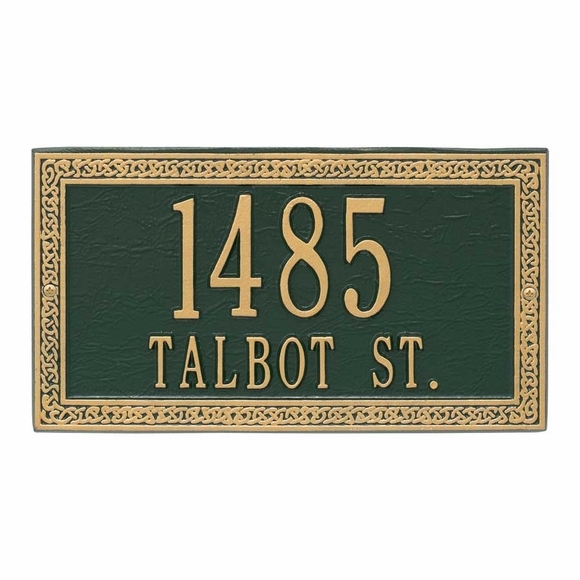 Handcrafted aluminum address sign for indoor or outdoor use. Line 1 holds up to 4 large characters. Line 2 holds up to 12 characters. Colors: AC antique copper, BG black with gold characters, GG green with gold characters, OG bronze with gold characters. Large image shown in green with gold characters. Small images (from left to right): antique copper, black/gold, green/gold, bronze/gold. Dimensions: 12.5"W x 7"H x 0.375". Alumi-Shield™ coating will protect your address plaque against the harshest weather and environmental elements and maintain its attractive appearance for years. Irish theme address sign features an elegant Celtic knot border. Made in USA.